I met Beth Custer, a freelance writer, through a networking group. She handed me her business card, but my first impression was that I couldn’t read it. I immediately squinted at the solid black background with reverse white and teal type. The contact information was a very small point size. Even with glasses, it was hard to read. Plus, the print quality was poor. The business card’s uncoated paper stock was porous and had soaked up ink. 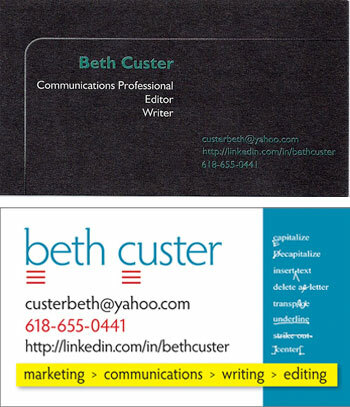 I offered to re-design Beth’s business card and give it a fresh look; in return, Beth would copy edit one of my projects. The only criteria: Beth wanted to keep the teal color. The new business card design emphasizes her name and phone number with larger point sizes and color. Instead of reverse type, it’s on a white background. (I like reverse type–when it’s easy to read!) Beth’s skills are listed on a yellow background, as if they have been highlighted with a yellow marker. Finally, I added proofreader marks as a graphic element. Outcome / feedback: improved typeface, layout, and readability. Beth was very pleased with the end result – an eye-catching, colorful, and memorable business card. Plus, I was very happy with Beth’s part of the trade – professional editing. Make your business card a memorable first impression. Need a fresh identity, business card, or marketing materials? Please contact N-K Creative at 314-548-6001. If you would like to see more examples of our work, please click the portfolio link.